Hello everyone, I'm Mio, a new PA artist since November 2013. I currently don't go to school anymore but I studied animal care & behavior in college because animals are my passion and I like to know a lot about them. but for mini customs it will be somewhere between 1-3 days and full customs between 1-5 days. also I would like to know since your an approved artist and have loads of xp with drawing and stuff,what brushes do you use?aslo do u work on photoshop?pc or mac? I use default brushes in photoshop, mostly the hard round brush and sometimes the soft round brush for some markings. I draw on a pc. wait so you use hard brushes though when i work on ps I always make the picture grow to about 1250x1250 resolution 300.
the brushes arent the same on a pc right? wow that's a big file x) but when you change the size to 150x150 are the pixels still good? Because pixels can change when the image size gets smaller or bigger. For coloring you can use any size. 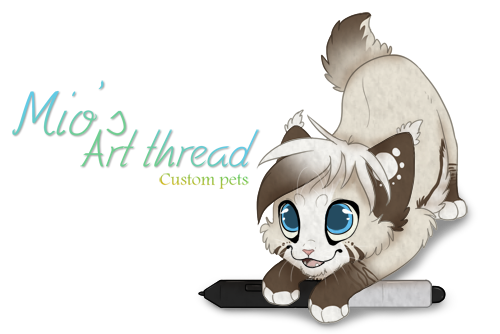 And also for resizing the canvas a lot of artists are now going for the bigger 150x150 px. because it allows them to show more details on the pet. what computer/program do you work on? oh so you work on a pc then right? Are you referring to PC as in Mac or PC or just in general of computers? People with really expensive drawing tablets can draw directly on it (it's touchscreen) and the screen its self is the program. I like all the pets you did for PA so far! Be sure that I'll be back sometime.